Yes - the pot roast was THAT good that we will be having it again! YUM! The recipe can be found in Paula Deen's new cookbook on page 125. There are a few recipes that I am doing this week from Disney's Family Fun Cooking with Kids booklet, a gift from the fabulous Kelly! 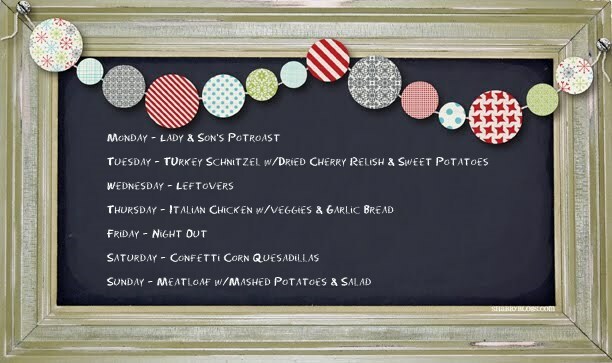 A whole week filled with dinners and goodies from the fabulous crock pot. Yay! If you want to join in, meet us back here on Saturday the 10th. Heather, is that a picture of a black board in your house? I love that cute sweet banner! It is pretty cute! I use Shabby blogs for my chalkboard images. I have a button on the right side of the page "Free is beautiful" under the Google Friend Connect.